Hiroshi Yamauchi, the man who led Nintendo into its success in video games, has passed away at 85. I can only imagine what long-time Nintendo fans feel of this news. Even in his passing, is Nintendo still under Yamauchi’s shadow? Read BBC’s article announcing Yamauchi’s passing. Yamauchi’s Nintendo went from playing card company to the gaming titan that still leaves some gamers awestruck at the company today. From what I’ve read of him, he didn’t succeed by being Mr. Nice Guy. That demeanor’s no different than most uber-wealthy business leaders. Yamauchi led Nintendo into video gaming’s version of Disney. Nintendo’s biggest franchises, appealing to all ages, started under his watch: Donkey Kong, Super Mario, Legend of Zelda, and so on. I think of one example of Nintendo’s early years in gaming: the original Wild Gunman. In it, the gamer had to shot the gun when the opponent’s eyes flashed. Electronic games like Wild Gunman are historical obscurities, but Nintendo didn’t give up. Much is written and talked about Nintendo’s triumphs and tyranny in the 1980s. After gaining success in Japan, they conquered the U.S. while its gaming industry was in shambles. Nintendo employed practices such as lock-out chips and other strong arm tactics. While some of us became Nintendo-4-Life, anyone examining Nintendo deeper would see that Yamauchi’s company did things THEIR way and didn’t readily adapt to external changes. Classic Nintendo games had a great level of accessability thanks to talent fostered under Yamauchi such as Shigeru Miyamoto, Gunpei Yokoi, and Yoshio Sakamoto. Yamauchi believed that “a handful of people in the world develop games that everybody wants.” Nintendo is criticized for many things, but Yamauchi and others had a knack for employing talented developers. 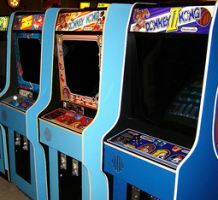 Nintendo cabinets in an New Hampshire arcade. Photo by Jamo Spingal. Image has been cropped and its size reduced. Read some Yamauchi quotes. He dismissed RPG players and Microsoft, and knew what gamers didn’t want: “grand games with higher-quality graphics and sound and epic stories.” Games with slick production values are in high demand. Microsoft is still committed to games and, with the help of a space marine, stole some of Nintendo’s thunder. As for RPGers… that’s up for debate. In the spirit of Yamauchi’s words, the DS and Wii have proven that Nintendo can still make sales with modestly-powered game systems with brilliant quirks. How far can they go with that strategy? The 3DS is doing fine, but the Wii U, Wii’s successor, is struggling in its first year. As someone who only observes Wii U from a distance, it seems to me that Nintendo is still inching towards embracing online capabilities, indie game devlopers, and downloadable content. It’s never good news when EA, the 500-pound gorilla of third party publishers, won’t give solid support for Wii U. That last bit reminded me of how Sega’s Dreamcast lacked EA games. Nintendo is far from Sega in the early 2000s, when they were dragged down by a string of failures until they had to survive by going third party. I also don’t wistfully desire the next Battlefield or Madden. Nintendo has the games to overcome early troubles. Yamauchi’s Nintendo had tricks up their sleeves that made them very profitable. In the early 80s, Donkey Kong and Mario made Nintendo a major company. By mid-decade, Nintendo’s 8-bit home console compelled many, especially in the U.S., to have some of the funnest experiences away from arcades. The Game Boy was the dominant portable gaming system, winning over kids and kids-at-heart even with incremental improvements. Nintendo purchase of Rare in 1994 paved the way for games, some of them classics, that would appeal to Western gamers. Even I loved Ken Griffey Jr.’s Winning Run back in the day. 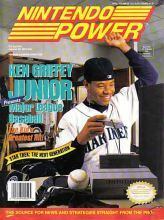 Nintendo made use of their synergy with Griffey, the 90s star of the Seattle Mariners. Yamauchi wanted to buy the Mariners which would make him the first foreign owner of a Major League franchise. The other owners, possibly in a “Don’t Let Japan Invade Us” mentality, refused the deal. Eventually, Nintendo of America became owners, with Yamauchi having less than 50 percent ownership. Mr. Yamauchi’s investment had great timing. In a few years, the Mariners would have their jubilant run to the American League Championship Series led by superstars Griffey, Alex Rodriguez, and Randy Johnson. That was the basis of a baseball masterpiece made by Rare, a company from a country that’s hardly into hardball. Nintendo’s near and dear to me, but I won’t fly a flag bearing the Nintendo Seal of Approval at half mast. Part of me wants Nintendo to silence doubters with the ultimate gaming console in hardware power and universal third-party support. Business reality then sets in. I will take a few moments to remember that Yamauchi’s tough character made stubborn, contrarian Nintendo a power player no one can completely ignore.